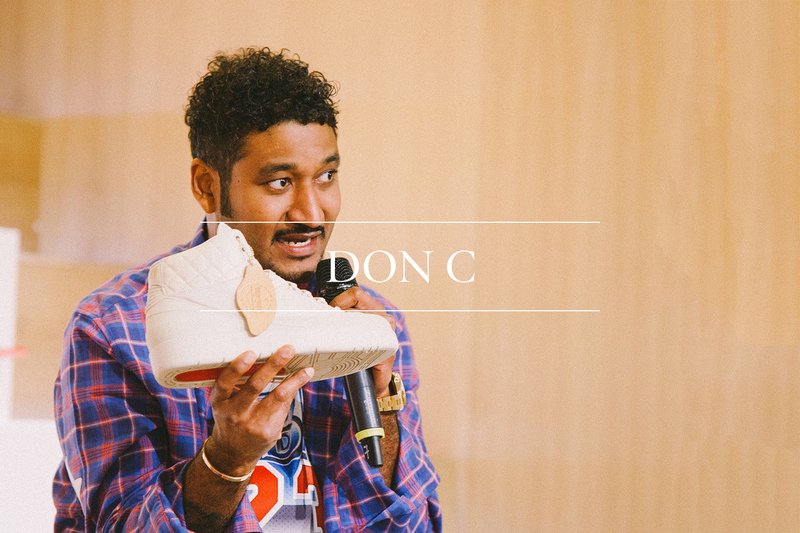 A couple of weeks ago THE DAILY STREET was invited to watch Don C give a talk on his latest release with Jordan brand in collaboration with his label Just Don. Just Don have been making hats and sports accessories with luxury treatment since 2011; what you’ll probably know them for best is the Mitchell & Ness snapbacks with the python peak and gold trim. Oh, and probably one of the biggest Jordan sneaker releases last year – a blue quilted Jordan II. This release is the second instalment of probably the most luxury sneaker by a sportswear brand ever. The Just Don x Jordan II ‘Beach’ features a vegetable tan patch on a buttery suede and quilted leather upper, all mixed up on the unlikely silhouette of a Jordan II. 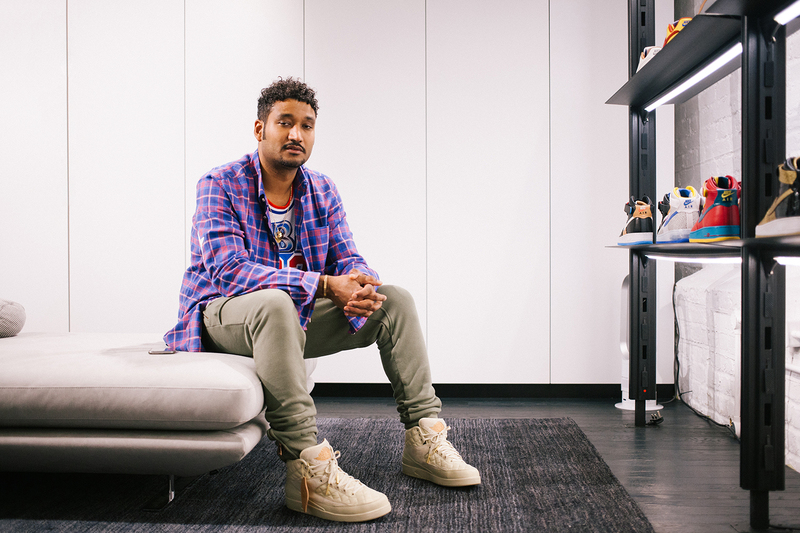 Don C discussed topics ranging from the shoe itself, to what kind of basketball player he is (good at defense (de-fense) FYI), to what it was like working with Jordan Brand again. Throughout, Don C was good-natured, funny, and refreshingly down to earth with a kind of strong mid-western U.S. accent. The vowels were drawn out but the talk was concise and was followed by a surprise inclusion of Jordan Brand athlete Victor Oladipo, in town for the NBA spectacle at the O2 Arena. 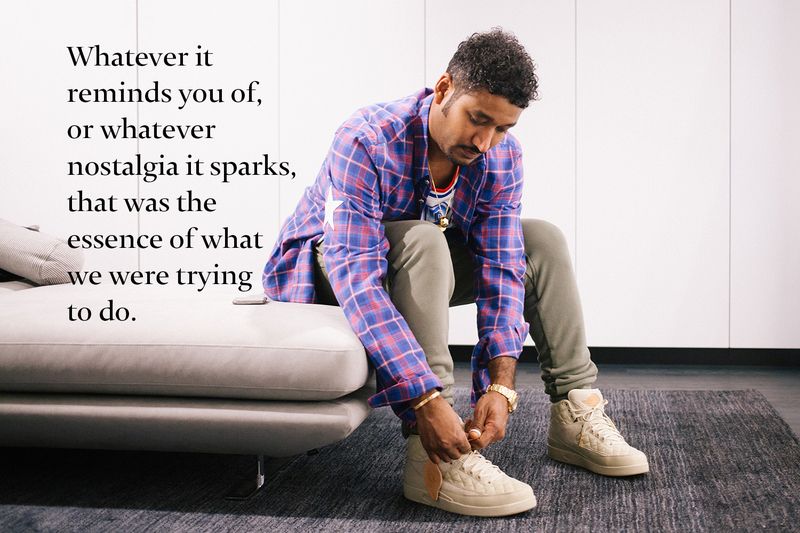 We sat down with Don C privately to talk some more about how this shoe was different from the last one, his experience with sneaker culture, and if anyone will ever be as good as the Jumpman himself. What was the creative process behind making the shoe and did you go to Portland to do it? Definitely, when developing the shoe we took quite a few trips to Portland and we were inspired by references of a lot of luxury goods that I had consumed throughout the years and brought them for the meeting as well as a lot of vintage Jordan stuff. I think the II was really a good shoe for us to do because the original II was produced in Italy and it was like the original luxury sportswear item in popular culture, period. So I think because luxury sportswear is such a key point in what my brand represents it ended up being really appropriate for our shoe to be the Air Jordan II silhouette. Were there any differences from the time before, with the blue one? Oh I was talking about developing the blue one, oh okay I’m sorry, developing this one particularly then… this real light creamy colour was one of the original colours that I referenced and I thought it was so appropriate as it makes the shoe look even more luxurious. I thought that the veg tan leather added another kick that a couple luxury brands might use for trim on something and it gives a good feel when it ages. It’s gonna age well. Was the Jordan II your favourite growing up? Oh no, that wasn’t my favourite Jordan. No, my favourites are the IIIs, IVs, Is, VIs, and Vs and IIs. It wasn’t my absolute favourite, but Air Jordan I through VIII I’m like I pick ’em pretty much when it comes to those silhouettes. This is the second collaboration you’ve done with a sportswear company having previously worked with Mitchell and Ness with Just Don. With that in mind, which teams do you support? The Bulls. I’m Chi Town all the way. It starts with the Bulls in basketball but I’m also a Lakers fan, I like the Warriors and I like LeBron so I like the Cavs too, but it’s hard to like the Cavs because I’m such a Bulls fan. [laughs] I was just playing, I don’t like the Cavs. You know man, I just be repping Chicago. I try to rep it wherever I am, even while I’m out here in London I’m repping my Michael Jordan jersey. Yeah I like a few different football teams, or, nah I take that back I like the aesthetic of a few football teams logos and uniforms, so I’m not really that familiar with the teams. I’m familiar with a lot of footballers but not the teams as much. I’m starting to do a lot of research on football teams because I do want to branch out and do caps for football clubs. I’ve already started in America with the MLS so hopefully we can branch over here one day. So what do you make of trainers becoming more of a commodity and a reselling culture? When you see your trainers on eBay for large amounts of money, how does that make you feel? Oh man it’s part of the culture. It actually kind of makes me feel good because it shows what the market value is for a product, you know? I love the way how commerce affects products and prices and stuff like that. 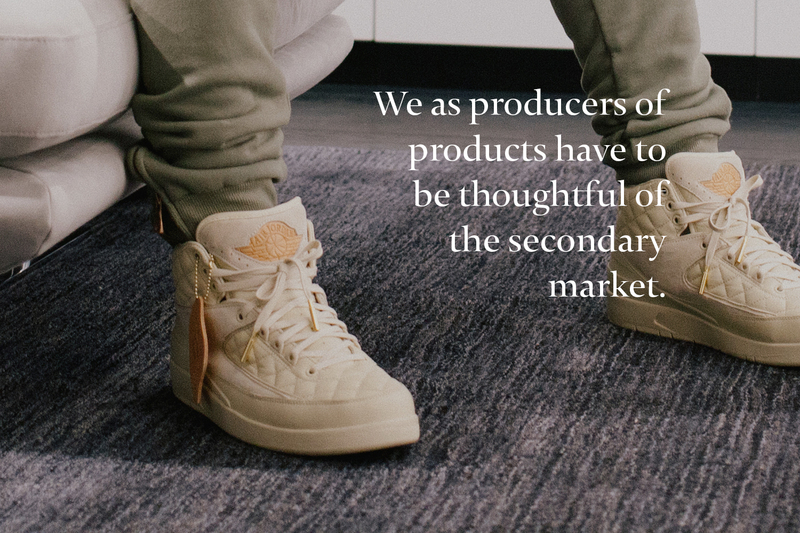 I think we as producers of products have to be thoughtful of the secondary market – it’s such a culture that we have to think about it when making products. Oh, so you try to bear it in mind when you’re designing the shoe? Yeah I love it. I come from the culture – I used to stand in line and buy twenty or thirty pairs of shoes and sell them. As a matter of fact I have a story about one of my buddies that was at the talk – Brad – I knew him from when I used to buy sneakers from him and he used to get UK releases and I used to get US releases and we would swap them. I would ship them over here and he told me he said “Man I never forget all the first sneakers that you used to send out here to me used to always have Kanye’s mixtape in the shoes” he said “I never heard of the guy and then one day I saw him on TV like ohhh this is the mixtape guy” and he just told me then so I thought that was a cool story. That’s a great story! 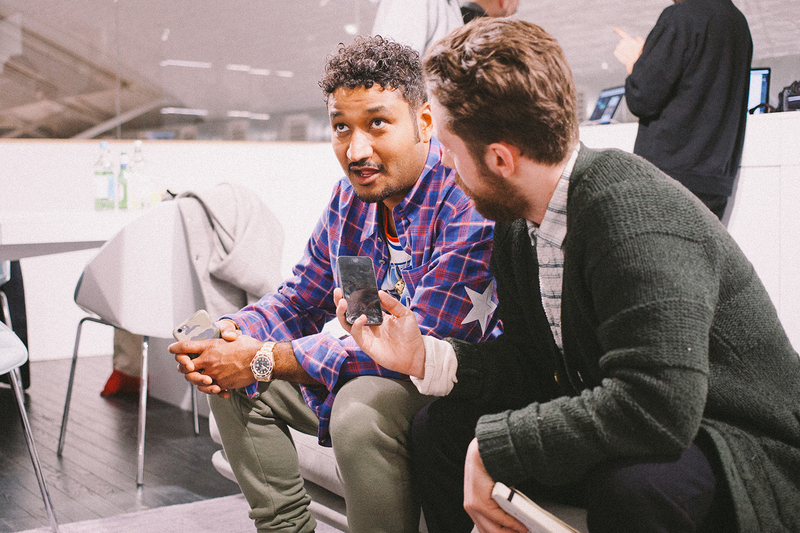 We just had London Collections: Men in town – do you follow high fashion as much as streetwear? I’m inspired by a lot of young designers, like just people that I’ve never heard of that I see items that they design and I’m really seeing that with a lot of young British designers. I’m really, really impressed with the pool of talent that’s here in London, with the young kids it’s especially amazing. It’s probably the best I’ve seen throughout the world. I think that the young kids in London have the aesthetic that’s probably the coldest in the world. Can I put you on the spot and ask you to name a couple? I don’t want to do that because then… ah, the reason that I don’t want to name them is I don’t want to put them on blast too soon or I might want to work with them and want it to be a surprise. So I don’t want to put nothing on blast, but I’m watching. If you get to do another collaboration with Jordan Brand, do you have an idea for what silhouette it would be? Well our first charity release was a Jordan I, then we transitioned to the Jordan II for public consumption, so I hope to do the Jordan III next. That would be the best thing to do, we just go in order man and let me do every Jordan. I love the brand, I love everything it represents, and I hope what I bring to the table upholds the proper heritage of Michael Jordan’s brand. You said that London’s one of your favourite places in the talk earlier, you said that it was top 2, will you tell us what the other one is? Pro’ly Paris, so it’s like one and two, Paris and London. Do you have any spots that you always go to when you’re here? I always go shopping but I shop at mostly department stores. I guess that’s mad commercial though. Harvey Nicks and Selfridges, so put me up on to the stores that are cool. You know of course I know like Dover Street, well what’s the spots to hit that I ain’t up on? You know, put me on. I might need to get a list from you after this interview. Yeah totally. Obviously Michael Jordan is a legend – do you think there will be another NBA superstar like he was? Absolutely, you mean like better than Jordan? You know how people always say that as the world revolves somebody is always going to be better than you… Man I really don’t see too much closer in our life time than someone being better than Michael Jordan. Of course you always want to progress, so hopefully somebody could be one day because that means that the next generation can experience moments that’s even greater than the ones we did, but I just can’t see it because it wasn’t just on the court, it was his cultural influence off the court, and at that time you know it was pre-internet that Michael Jordan had this influence on the world. I don’t think that anybody else could do that because the internet allows us to consume so much so immediately. I don’t think that we appreciate what we consume. So it’s not like Michael Jordan where we really fiended for those clips and stuff, so maybe somebody could be a good basketball player, but never another Michael Jordan. It’ll probably be somebody who has a totally different style as Mike that could be considered as the best, but I don’t think that anybody trying to be like Mike will ever be better. You’ve got to have a different style of game to even try to be… I would guess, I don’t know though. Ah nah I love it because it shows that the culture is all about creativity and making a difference in the world and I think that we respect the people that have been able to create things that have changed the world and changed the scope on the planet and kids just want to emulate that and they want to copy that and I think it’s dope. You were talking about referencing a couple of luxury brands and I see that you’ve got the quilting on the shoe – I wondered if the references were a specific nod to one or two luxury brands? Ah man, well you know, we just influenced. You see what it is… What feel do you get when you see and touch this? Whatever feeling that gives you, I hope that we execute the design in the proper way to give you that feeling. Whatever it reminds you of, or whatever nostalgia it sparks, that was the essence of what we were trying to do. Sportswear has come through in luxury fashion and it has also gone the other way with, for example, Balenciaga coming out with a super expensive high top. Do you think that maybe Jordan Brand will go down a similar way in the future, creating a luxury line? Oh I think this is what we’re doing right here, to compete against luxury brand’s shoes. We showing you that this is a true basketball performance sneaker that’s also a luxury shoe. You can wear it in the club and you can wear it on the court, so it’s smashing anything. You know, you take any luxury sneaker and you can’t hoop in them, so this one you can. Lastly, are you going to wear this pair next time you play? Oh yeah, absolutely 100%. I wear my blue ones when I hoop now. No problems.